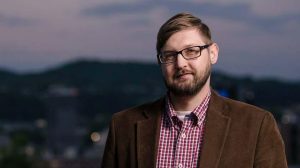 Dave Mistich, host of West Virginia Public Broadcasting’s “The Legislature Today,” said the legislature is trying to “peel back” severance and sales taxes by trying to give industries which may be depressed a break, such as the coal industry. “We’re seeing taxes drop, but no new source of revenue coming,” Mistich explained. In addition to Mistich’s comments, we’d like to thank Roseshalla Holmes and the staff of Four Points by Sheraton for an outstanding meal and a marvelous chocolate lava cake. Congratulations to Crystal Young, a guest at the meeting, for winning the door prize from Roseshalla. The 2020 session will be tough financially.